Nestle Drumstick Pair-tography ~ Philippine Freebies, Promos, Contests and MORE! Pair up, pose, and post your photos in the Nestle Drumstick Duo Pair-tography challenge. Each week, there will be one (1) photo challenge for you to follow in which it should be done in pairs. For this week (Challenge #4), "'Better 'Pag Two!' Challenge!" requires you to answer "Anong favorite activity mo na mas-better gawin with your Ka-Duo?". Include Nestle Drumstick Strawberry & Cream and Chocolate & Vanilla in your photo. Get drawn for a chance to win Shakey's Certificate worth P4,000 for you and your Ka-Duo. You can only submit one (1) entry per photo challenge. Also, don't forget to submit your entry for Challenge 1 to qualify for the Grand Raffle, where you and your Ka-Duo can win P100,000! Special prizes will also be given away for the Most Voted and Most Creative photos: 2 units of Samsung Galaxy Tab 2 (7.0) worth P20,000 each for you and your Ka-DUO! 1 Drumstick Duo Challenge! Kumain ng Nestlé Drumstick Duo… then STRIKE A POSE! 10 winners of Nestle Ice Cream Party Packages worth P3,000 for you and your ka-DUO! --- picked via electronic raffle. 2 Color-Me-Duo Challenge! Dress up in pink and brown! Sino ang pink? Sino ang brown? 5 winners of SM Movie Passes worth P4,000 for you and your ka-DUO! --- picked via electronic raffle. 3 ‘Anong Flavor ka?’ Challenge! Ang iyong best interpretation of Strawberry & Cream or Chocolate & Vanilla Nestlé Drumstick Duo! 4 winners of Pancake House Gift Certificate worth P4,000 for you and your ka-DUO! --- picked via electronic raffle. 4 ‘Better ‘Pag Two!’ Challenge! Anong favorite activity mo na mas-better gawin with your Ka-Duo? 4 winners of Shakey’s Certificate worth P4,000 for you and your Ka-DUO! --- picked via electronic raffle. 5 Drumstick Twin Challenge! You and your Ka-Duo, we challenge you to look like twins! THEN STRIKE A POSE! 4 Winners of Sanuk Gift Certificates worth P6,000 for you and your Ka-DUO! --- picked via electronic raffle. 6 Duo Skit Challenge! Double trouble ang iyong creativity! Gumawa ng photo skit using Drumstick Duo as props! 2 Winners of Bench Shopping Spree/Gift Certificate worth P10,000 for you and your Ka-DUO! --- picked via electronic raffle. 7 The Duo Tandem Challenge! Mag-anyong favorite tandem ninyo at mag-pose! 1 Winner to receive 2 units of Samsung MV800 worth P10,000 each for you and your ka-DUO! --- picked via electronic raffle. 8 DFF (Duo Friends Forever) Challenge! Bakit kayo ang perfect mag-Duo for each other? Strike a pose and show us why! 1 Winner receiving 2 units of Samsung Galaxy S3 worth P36,000 for you and your Ka-DUO! --- picked via electronic raffle. 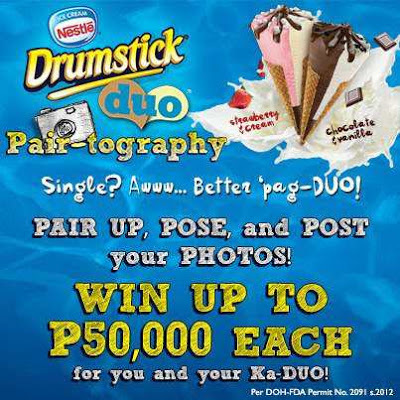 9 Nestlé Drumstick Duo Pair-Tography (GRAND PRIZE) 1 Winner receiving a cash prize of P100,000 for you and your Ka-DUO! P50,000 each. --- picked via electronic raffle. 10 Special Prizes (Most Voted) 1 Winner to receive 2 units of Samsung Galaxy Tab 2 (7.0) worth P20,000 each for you and your Ka-DUO! 11 Special Prizes (Most Creative) 1 Winner to receive 2 units of Samsung Galaxy Tab 2 (7.0) worth P20,000 each for you and your Ka-DUO!